This model is a product specially designed for jewel laser welding. The jewelry laser welder is mainly used for repair welding of gold and silver jewelry and spot welding. The jewelry laser welding machine is one of the important aspects of the laser material processing technology. The welding process of the laser spot welding machine is a heat conduction type. That is, the laser radiation heats the surface of the workpiece. The surface heat spreads to the inside through heat conduction and controls the width, energy, peak power and repetition of the laser pulse. Frequency and other parameters, the workpiece melted to form a specific molten pool. Due to its unique advantages, the jewelry laser welding machine has been successfully applied to the processing of gold and silver jewelry and the welding of micro and small parts. 1.PE-W100/W150 is very compact, can be put in desk, water chiller is integrated, plug and play. PE-W200 has an atmospheric appearance and high power, which can be used for spot welding of most metal materials. 2.The laser jewelry repair machine adopts British imported ceramic condenser chamber, which is resistant to corrosion, high temperature, high photoelectric conversion efficiency, life of condenser cavity (8-10 years), and xenon lamp life of more than 8 million times. 3.The use of the world's most advanced automatic shading system of the laser jewelry repair machine eliminates irritation to the eyes during working hours. 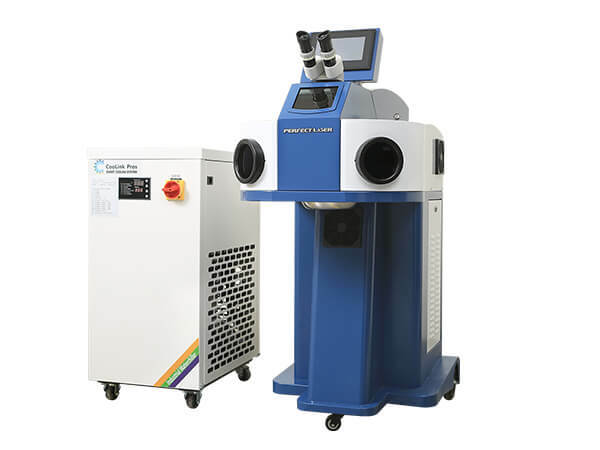 4.The jewelry laser welder adopts air-cooled cooling, no water-cooling machine is required, and the whole can be placed on the desktop for use, and the volume of the jewelry laser welder is small. 5.Ergonomic design of the laser jewelry repair machine is ergonomic and does not fatigue long hours of work. 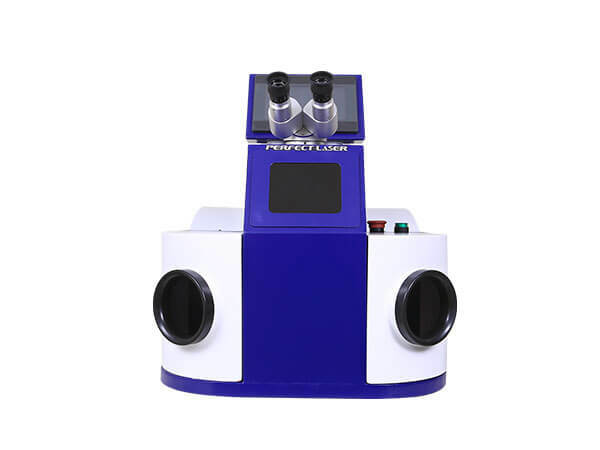 6.Microscope and CCD double observation system, CCD is built in the control screen, reducing the external space of the jewelry laser welding machine. This model is a product specially designed for jewel laser welding. The laser spot welding machine is mainly used for making holes and spot welding of gold and silver ornaments. The laser spot welding machine can also be applied to cold working high alloy steel, hot forged high alloy steel, nickel-containing tool steel, advanced Weld-welded metal materials such as steel, copper alloys, brass, copper, and high-toughness aluminum alloys. Temperature 5℃~30℃, humidity < 85%. External (1P), leaving a proper spacing around to ensure heat dissipation.